Ask the owner (salesperson) if the car has had any accidents? If he knows about it - he has to inform you. However, in the real life most of the salesperson will hardly tell you that the car is after an accident. So, rely only to what you see, not what you have been told. What kind of body repair has been done? 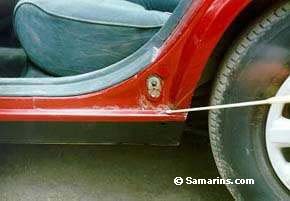 There is no problem if only one body panel (a fender or door) had been repaired, because of minor damage. But avoid cars that had serious damage or have been flooded. 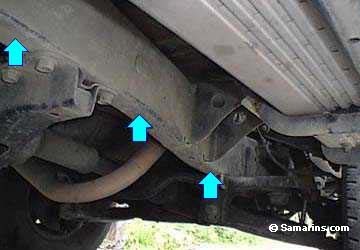 Also avoid cars that had been rusty and then repaired. A rust tends to reappear again. Look down the length of the car. The lines of the car body should be straight. Look at the image on the side of this Mercedes; this car hasn't been in any accidents, as you can see. Look at the reflection; it is perfect. Try to check the entire car this way.
! If the car is dirty, don't hurry. Ask the owner to wash it, or you may notice nothing. But look at this image. Check this Toyota's rear fender. You can notice that the reflection on the rear fender isn't perfect. Therefore, you can suspect that this rear fender has been damaged, although I think it's not too big a problem if only one body panel has been damaged. But at least you can ask for a lower price. 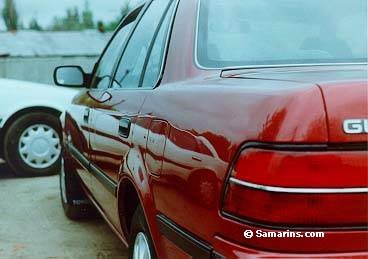 Check all the gaps between the fenders, doors, hood and trunk. Every gap should be even along its entire length. Look at this image. The gap is wide at the top and narrow at the bottom, which probably means this car has been hit at its right front corner. Try to inspect all the gaps the same way. 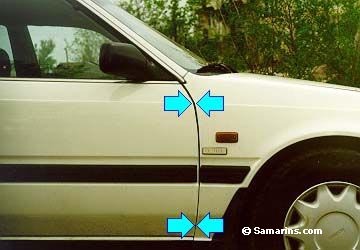 If one of the gaps looks too narrow (too wide) - compare it to the same gap on another side of the car, they have to be of exactly the same width. If they are notable different, it's very possible the car has been in an accident. Try to find the border between original and new paint. Look at this image. This is the Toyota shown above. As you already know, its left rear fender has been repainted, but its roof has not been repainted, which means there should be a border between the different coats of paint. Try to check all such places; maybe you'll find one. 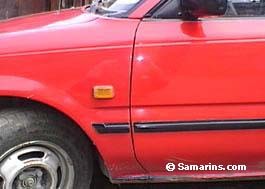 Though a skilled painter may make such a border almost invisible, you'll find it somewhere if you check the entire car carefully, so take your time. Check the places behind the doors and under the hood and trunk. There is a spot of new paint on the rubber hose in this image. Try to check carefully all such places (behind doors) for paint over spray. 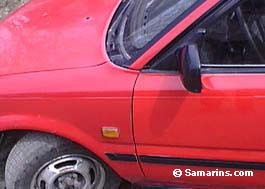 It shows you that the car has been repainted. Check the hood and door holding bolts. 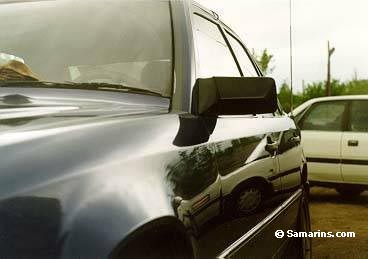 It's very difficult to paint some replaced or damaged part (like a fender, door or hood) in exactly the same color as the original paint. Try to figure it out. Take a look at the car from different angles and from various distances. (Look at the images. The color seems to be the same on the top image, but from the other angle you can note the difference). Try feel the painting with your hand; originally paint should be perfectly smooth.
! If you feel some unevenness under the paint, it's a sign that this area has been repainted. Look closely at the paint again. You may notice some little things under the paint (a little piece of hair, dust, etc.). It's the same sign. Look at these image. This is one of the common places corrosion begins.
! If you find some spot of corrosion, continue your search more carefully. Check the floor under the carpet, door's bottom, trunk and wheel arches. 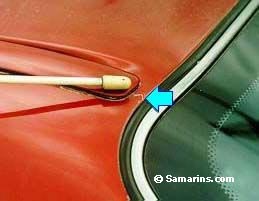 Take a little magnet and try to make it cling to the bottom of the doors, fenders and other places where you suspect some defect.
! 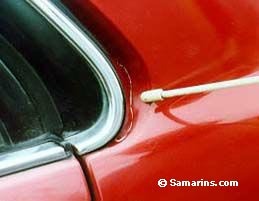 If there is too much filler under the paint, the magnet won't cling. 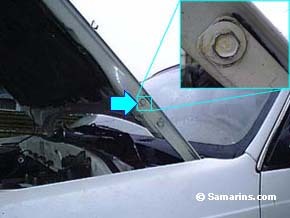 However one or two small spots of corrosion isn't a big deal. Some cars have a frame (most of SUV's, trucks, some vans, large passenger cars, etc.). 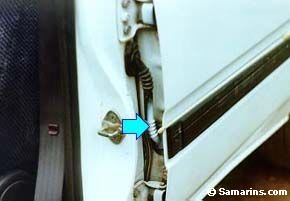 The car's frame (marked with a blue arrow on the image below) is very essential to support the vehicle. Try to check the entire length of the frame. It shouldn't have any traces of damage (welding traces, cracks, etc.) or be rusty through . How to check whether the car has been flooded. Check the places under the car carpet.
! If there is too much moisture under there, and the car wheels and other metal parts are too rusty, you may suspect that this car has been flooded. Avoid such a car.